Background: The customer lives in a 4000 square foot home that was in a “U” shaped manner. Their current wireless router is installed at the one endpoint of the house. They require wireless connectivity for the opposite endpoint of the house. Problem: The customer has purchased the TL-WPA4220 KIT, installed the TL-PA4010 adapter near the router, and the TL-WPA4220 WiFi extender in the area that needed a wireless connection. At the end of the installation, there was no connectivity of the two devices. The powerline light that should be on never turned on. Other outlets were tested, and the one outlet that did work ended up being in a section of the house where WiFi is not needed. need this to connect to two rooms, so need a triple pack....is this available ? It depends on how close the two rooms are and if there is anything that would destrupt the wireless of the device. 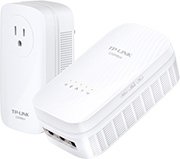 a two pack contains a non-wireless unit that you would connect to the router and a wireless unit you would use remotely. The signal range would be every bit of that a router would put out so if the rooms are close enough a single pack should suffice. If they are further away or there is interference then a extra adapter might be needed. We only sell adapters in kits, but the "extra non-wireless unit can also be used as a remote added a 3rd remote device. This would be ideal for game consoles or Smart TVs where you wouldn't really want to use wifi. I cannot find any of the WPA8730KIT's in a US retailer. Who stocks them? Upon looking into it the TL-WPA8730Kit has been EOLd. This means once our retailers run out of stock they will no longer be available. At this time the TL-WPA8630 Kit is the fastest powerline kit available.